Ovens are generally grouped into 2 common kinds: gas oven and electric oven. There are also microwave oven (uses microwave radiation to cook or heat food) and convection ovens (uses a circulating fan to move hot air around the food inside the oven). With this range of choices, not to mention the variety of features and designs available in ovens, shopping for one can be a difficult task. Below are some guidelines that you need to consider – helpful hints that will help you buy the right oven. Whether ‘freestanding’ (set in a range) or ‘built-in’ in walls (known as wall ovens), make sure that you measure the size of the oven against the location where you plan to have it installed. The location should not only have enough space; it should also be sturdy enough to support the unit. The capacity. The “actual” size of the oven is defined by its capacity. The oven capacity refers to the amount of food or the size of the container that it can hold. The size of the oven is that you need to consider when buying an oven is the size of its interior (the cavity). Note that some ovens seem large on the outside but are actually smaller inside. a. Analog – mechanical switches that use knobs. Are less expensive but more durable; can also be less precise, since everything is set manually. b. Digital – electronically-controlled push buttons. The most common nowadays, they can be more expensive and less durable; but they have more accurate and precise settings, since everything is set automatically. b. 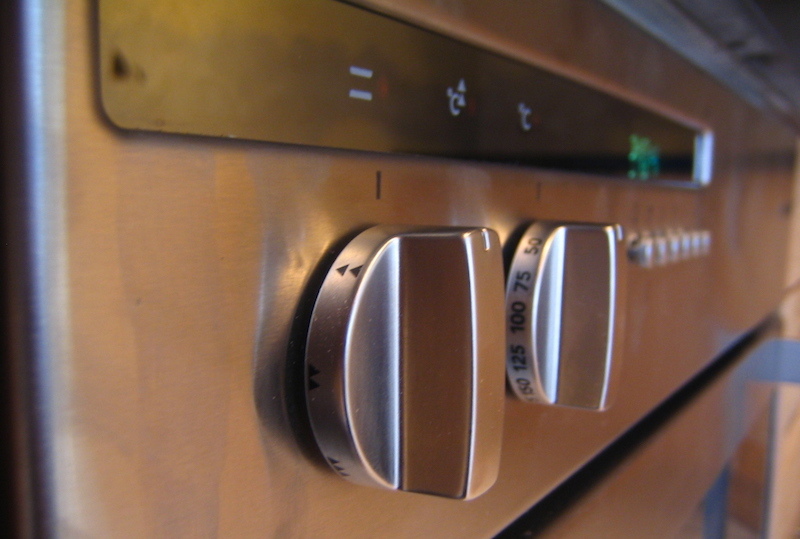 Temperature settings – allows you to set the temperature for cooking. c. Thermostat – senses and maintains a set temperature to stop or further the flow of heat. This prevents an overcooked food and an overheated oven. d. Oven light – enables you to see the interior of the oven to check the status of the food the you are cooking. a. Oven rack – allows you to place more than one dish in the oven at the same time; should be thick and durable. b. Rotisserie – a removable grill with a turning spit; for better and uniform grilling. a. Clear-view window – it enables you to watch the cooking process without having to open the door. b. Self-cleaning option – found at the control panel, pushing this button enables the oven to clean itself. c. Lockout feature – can be a button in the control panel or a door lock switch, it prevents misuse or unintended and accidental operations, especially when cleaning the control panel or when there are children in the house. Of course, everything is greatly affected by the price, so it is important for you to set the amount that you would like to spend.